Peripheral vascular disease (PVD) is a condition where the arteries that supply the legs are abnormally narrowed or occluded. This prevents normal blood supply to the legs and can cause claudication or threaten limb loss. Claudication is leg pain that occurs while walking that is relieved by rest. If peripheral vascular disease becomes severe, patients can experience tissue loss/soft tissue wounds and even limb loss or the need for amputation. PVD is initially diagnosed by symptoms and physical exam findings such as decreased pulses. The diagnosis can be further investigated with non-invasive testing such as an ankle-brachial index (ABI) or CT Angiogram of the legs. Both of these studies evaluate the patency and flow in the arteries of the legs. When patients are symptomatic from peripheral vascular disease, they can undergo an arteriogram to diagnose and treat the narrowed arteries. The arteriogram is a minimally invasive procedure performed by an interventional radiologist in the outpatient setting using local anesthesia and IV sedation. The abnormal, narrowed arteries of the leg can be treated in the same setting using balloons and stents to improve blood flow. Most patients tolerate the procedure very well and are discharged home the same day. 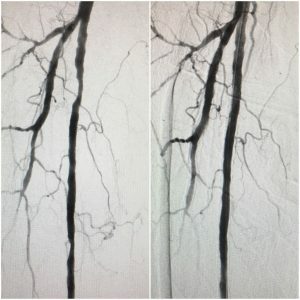 Fixing these arteries of the legs can significantly improve symptoms and help prevent major surgery or amputation. Like arteries of the legs, arteries that supply other organs can become abnormally narrowed and cause various medical problems. Chronic mesenteric ischemia is a relatively uncommon medical condition that is caused by narrowing or obstruction of the main arteries that supply the bowel. Ischemia is a term used to describe a lack of blood flow. If chronic mesenteric ischemia is undiagnosed or overlooked, it can result in acute ischemia of the bowel. This carries a significant mortality risk. When blood flow to the bowel is chronically inhibited or decreased, the patient can experience vague abdominal pain and discomfort. Patients typically experience abdominal pain after eating and eventually develop an aversion to food, resulting in weight loss. When other more common causes of abdominal pain and weight loss are excluded, chronic mesenteric ischemia should be considered. The diagnosis can be made from symptoms and imaging such as ultrasound and CT angiography. Once the diagnosis is made, an interventional radiologist can perform an arteriogram to treat the abnormal arteries. During the procedure, a small catheter is inserted into a peripheral artery through a tiny incision under IV sedation and local anesthesia. The narrowed artery is then carefully dilated and under x-ray guidance over a small wire. This improves the blood flow to the bowel, improving symptoms and reducing the risk of acute mesenteric ischemia. Most patients return home the same day with little or no recovery time. The main advantage of catheter directed therapy is to avoid open surgery to try to fix the artery. Open surgery has significant increased risks to the patient. Renal artery stenosis is a disease characterized by narrowing or blockage of the arteries that supply the kidneys. This is usually caused by atherosclerosis, a systemic disease causing narrowing of the arteries throughout the body due to plaque build up. It is the same disease that causes heart attacks and strokes. When the arteries of the kidneys become severely narrowed, uncontrollable high blood pressure and renal failure can occur. The diagnosis is usually made by clinical history and an imaging study such as ultrasound or CT angiography. Once the diagnosis is made, an interventional radiologist can perform an arteriogram to try to treat the abnormal kidney artery. During the procedure, a small catheter is placed in a peripheral artery through a tiny incision under IV sedation and local anesthesia. The narrowed artery is then carefully dilated under x-ray guidance over a small wire. This improves the blood flow to the kidney, improving symptoms in many patients. Most patients return home the same day with little or no recovery time.